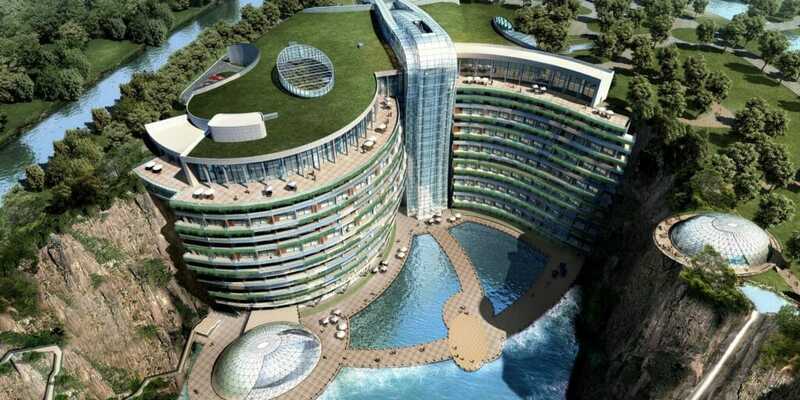 The world’s first quarry hotel has opened in China, buried up to 90 metres deep underground. The $200 million InterContinental Shanghai Wonderland was built into the side wall of an abandoned quarry in southwestern Shanghai. The 336 room hotel has two floors above ground, 14 in the quarry and two underwater floors. All the underground rooms are encased in a turquoise aquarium. A cascading glass waterfall tumbles down the centre of the hotel. Each of the rooms has a stunning view of the exposed rock face. But if that view isn’t good enough, you can actually try rock climbing it or bungy jumping from the top into the craggy pit below. The futuristic pool will be the highlight for most kids. All hotel rooms on the bottom floor are provided with an around-the-clock butler service. “This is an architectural masterpiece which is a wonder and beauty in the global hospitality industry,” Lin Wang, chief marketing officer of Greater China, IHG says. 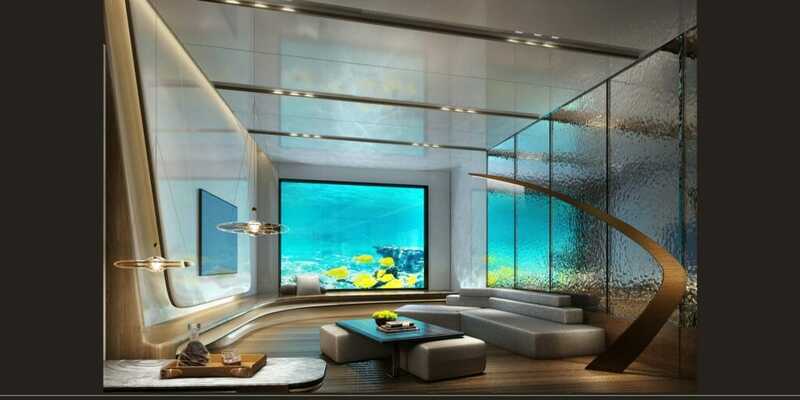 The underwater rooms at the Intercontinental Shanghai. Picture: Supplied. So how much will all this cost you? About $A767 a night. So perhaps just a one-off luxury stay. Hotels are increasingly trying to see how outlandish they can be. The Maldives have an underwater hotel. This is China’s response and it is an astonishing one. Gamirasu Cave Hotel is a restored thousand-year-old Byzantine monastery in Ayvali Village, Turkey. It has two underground cave suites. Sala, Sweden has a suite you can rent that is literally down a silver mine shaft. Disused, of course. If you don’t fancy going international White Cliffs, NSW has an Underground Motel. It is not the only underground building in town either. Or why not try Cooper Pedy, SA. It has an underground motel too. Both of Australia’s underground motels are in formerly opal-heavy areas.